This is the 15th in a series about Indiana’s metropolitan statistical areas (metros). All of the data used in this article can be found using the USA Counties in Profile and Metros Side-by-Side feature on STATS Indiana (www.stats.indiana.edu) unless otherwise noted. Because we are using annual data for this series, the information will not reflect some of the significant downturns in economic conditions. The Elkhart-Goshen Metro consists of a single county—Elkhart—and is located in north-central Indiana. 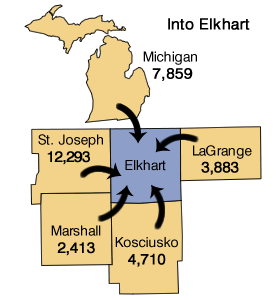 The Elkhart-Goshen metro had a population of 199,137 in 2008, making up 3.1 percent of Indiana’s population. The metro’s population has rapidly grown (27.5 percent) from 1990 to 2008, exceeding both Indiana (15 percent) and the United States (22.2 percent). The swift population growth stems from the metro having a 455.9 percent increase (13,368) in the Hispanic population from 1990 to 2000. Between 2000 and 2007, the Hispanic population grew an additional 68.1 percent (11,105 individuals) and became the third most populous Hispanic county in the state with 27,405 individuals (see Figure 1). Between 2007 and 2008, the Elkhart-Goshen metro experienced natural increase (births minus deaths) to overcome a negative net domestic migration (more people moved out of the county than into it). The largest population group in the area is young adults (ages 25-44) at 29.2 percent. Source: IBRC, using U.S. Census Bureau dataJust 20 percent of the Elkhart-Goshen population has an associate’s degree or higher, compared to 25 percent for Indiana and 31 percent for the United States. This is likely driven by the fact that good-paying jobs that didn't require college had been plentiful. According to the Bureau of Labor Statistics (BLS)(latest full year data being 2008), nearly one in every two jobs (46.4 percent) in the Elkhart-Goshen metro was in manufacturing, which considerably exceeded Indiana and the nation (18.2 percent and 10.0 percent, respectively). Consistent with state and national trends, health care and social assistance and retail trade were also in the top three industries for jobs in the metro (see Figure 2). Source: IBRC, using U.S. Census Bureau dataFrom 1998 to 2008, the BLS data reported that the Elkhart-Goshen metro area lost 2,299 jobs (a 2.0 percent decrease), yet gained 188 new establishments (a 4.0 percent increase). In the same timeframe, Indiana and the United States gained jobs (0.8 percent and 8.6 percent, respectively) through a 6.5 percent and 19.3 percent increase in establishments. In 2008, 829 manufacturing establishments employed 53,066 people with an average annual wage of $39,773. This average wage is below the state ($52,373) and national ($54,449) average wage for manufacturing jobs. After adjusting for inflation, wages in Elkhart-Goshen have decreased $2,090 from 1998 to 2008, a real decrease of 5.5 percent. Meanwhile, Indiana decreased by 0.2 percent, whereas the United States experienced a 7.8 percent wage increase. Of all the industries, management of companies and enterprises paid the highest wages across all three geographies (see Figure 3). Overall, wages in the Elkhart-Goshen metro were 78.7 percent of wages in the United States. In Indiana as a whole, wages were 84.3 percent of the nation’s wages. Since the Elkhart-Goshen metro is heavily dominated by manufacturing jobs, it was of interest to examine the commuting patterns into and out of Elkhart County by using the annual commuting trends profile data on STATS Indiana. The metro is a net importer of workers, bringing in 35,230 workers from elsewhere while 8,374 workers leave Elkhart County for work in other counties in the United States. 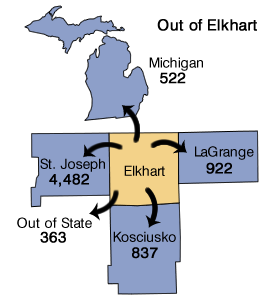 Figure 4 shows the top five counties that are receiving Elkhart County resident workers and the top five counties sending workers to Elkhart County. Over time, the Elkhart-Goshen metro has been successful in increasing the quantity of establishments, but has seen a gradual decline in jobs and wages. Given the dominance of manufacturing in Elkhart-Goshen, this region has been especially hard-hit in recent months by the recession, as noted by the first article in this issue. It has experienced some of the highest unemployment rates in the nation and garnered national attention, such as MSNBC’s Elkhart Project. While it will take some time to turn around the metro’s economic fortunes, significant changes have already occurred this year with the beginning of a turnaround in the recreational vehicle industry and the region’s focus on diversification strategies. Work has also begun on “future vehicles manufacturing,” life sciences expansion and attraction efforts.1 Officials are showing business prospects the benefits of the metro’s skilled and affordable workforce. See the Elkhart County Econonomic Development website at www.elkhartcountybiz.com. Indiana's Elderly: How Are They Doing?